Fact is stranger than fiction. A good biography beats a good story any day, but to write a good biography an author needs not only an interesting subject and a degree of empathy but also a good supply of both primary and secondary sources to draw from. In The Real Mrs Beeton, The Story of Eliza Acton Sheila Hardy has made a brave attempt to breath life into the woman credited with being the best cookery writer in the English language but sadly the real Ms Acton eludes her. To be fair this is not entirely Sheila Hardy's fault. Eliza Acton left no diaries or letters, not even a will, to posterity, no written record of her life at all other than the poems she published and her books Modern Cookery and The English Bread Book. Of her family and friends no one has left more than a fleeting glimpse of their association with her. A sympathetic reader of Modern Cookery would picture Eliza as thorough and precise; an intelligent, well educated and well read woman of her time, not lacking in a sense of humour, with a lively interest in the world around her and a wide circle of friends and acquaintances. Self evidently she was also interested in food and eating and the principles of household economy. Unfortunately, despite a valiant, but not altogether satisfactory, effort to place Eliza in context and to put flesh on the bones of her family and friends (running to more than 200 pages! ), Sheila Hardy can add little to that picture. There just isn't enough hard evidence to do more than hedge around what little information is verifiable with 'perhaps' this, 'it is likely' that or 'one could assume'/'we can imagine' the other. This is a shame because Eliza did mix with some interesting people, just how, why, when and where remains a mystery. Who was the love of her life (an unknown Frenchman? ), why did she go to France (for the sake of her health? ), did she have an illegitimate daughter (probably not - well not one that survived) will have to remain questions open to speculation. 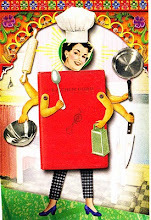 For me the biggest puzzle is why Eliza thought to write a recipe book in the first place. What motivated her to devote ten years of her life to a cookery book? What experience did she have of the kitchen? Hardy suggests that the recipes were most likely tested by her servant Ann Kirby but Eliza must at least have spent many hours observing and taking notes and the details in some cases are so exact that surely Eliza had hands-on experience of her own. Was it her publisher who suggested the idea of a cookery book and if so why did he think Eliza was the person to write it? Sheila Hardy asks this question herself but fails to provide a satisfactory answer. Perhaps Eliza was urged by her friends to make a record of her recipes. Hardy presents some evidence that Acton openly solicited her friends for recipes to include but it seems to me unlikely that she only started to collect them once she had made up her mind to write a cookery book. In the end I suppose the whys and wherefores don't really matter, we should just be thankful that Eliza staked her future on recipes and not rhymes. Sheila Hardy, The Real Mrs Beeton. The Story of Eliza Acton, The History Press, Stroud, 2011.